The circuit-bending rock band, CMKT 4 paid a visit to Ace Monster Toys this last Thursday. CMKT4 plays a rather different sort of music, which you can hear over on their Reverbnation page. The guys (Zach, Austin, and Jeff) rolled up and worked with a bunch of our local monsters on building contact microphones. 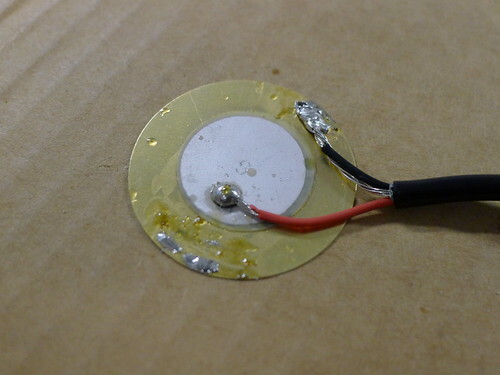 This involved taking a piezoelectric sensor, soldering some leads directly to the crystal element and the brass border on it, attaching wires, and gluing this into a bottle cap. 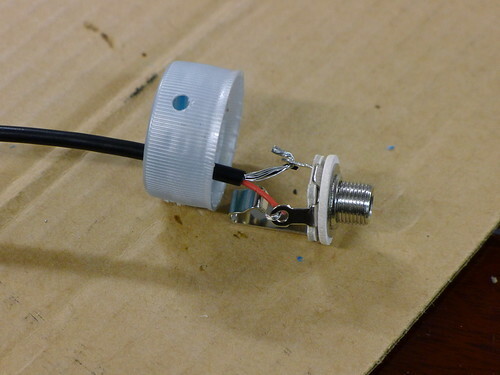 The other end of the leads as soldered to a standard audio jack, which was also put into a bottle cap. 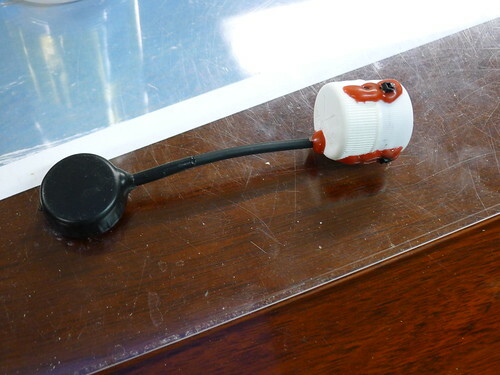 Copious amounts of hot glue and a fair amount of liquid plastic (to seal the sensor) were added to this mix. 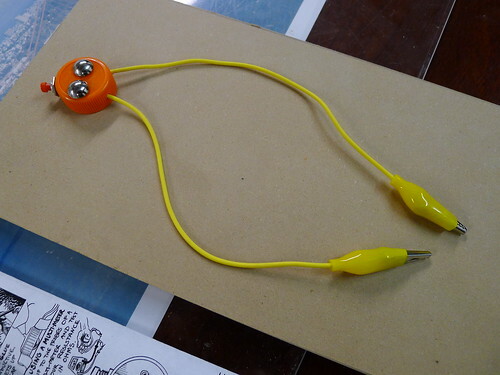 Most of us also made a circuit bending device as well, which allows you to attach leads to interesting points on children’s speaking toys to see where one might attach switches or potentiometers in order to have them make interesting sounds, which is a mainstay of CMKT 4’s music. 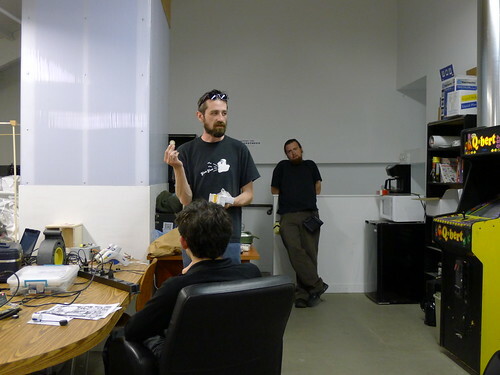 CMKT 4 is on a tour of American hackerspaces for the month of May, including a visit to Maker Faire in San Mateo next weekend. They’ll be performing on stage there and visiting various people so I encourage attendees to check them out. 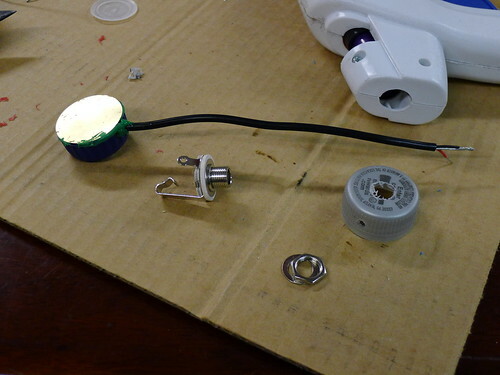 They’ll also be selling contact microphones and kits of parts for those that want to make there own. I’ve added Dallas Moore’s video from a few days ago about circuit bending with CMKT4 and Creme Dementia. It definitely gives a feel for what the guys were showing us and talking about for those that couldn’t make it to the event.